DU-46-S Walnut Creek Mountain Dulcimer package. DU-46 Walnut Creek Mountain Dulcimer. Hourglass shape 34 1/2" long, 7 1/2" wide. 2" soundbox. Soundholes have leaf cutouts and burnt in vine along with the basic design of hummingbird, bluebird, deer, dove, cross and heart. Solid Walnut scroll head and fretboard, sides and back. Solid wood top varies. Walnut, cherry, cedar, and redgum are most often available. 6 1/2 and 12 1/2 fret included. 27 1/2" fret scale length. 4 string with double melody and equidistant spacing option. 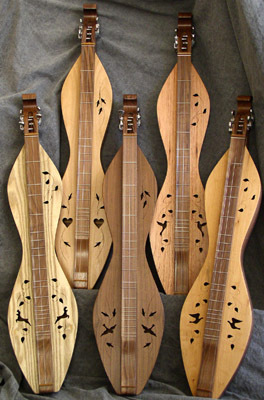 Available as instrument only or as a package that includes noter, pick, TK O'Brien's Guide to Playing the Mountain Dulcimer, padded heavy duty nylon carrying case. 3 year warranty.